Not that the more visceral ones are forged out of malice, but Truth or Dare, the latest release from Blumhouse Productions, is a friendly horror movie: PG-13, with a cast of beautiful young people with perpetually immaculate hair and razorous jawlines, it’s competent but forgettable, with a couple laughs and some squirmy set pieces (thinking mainly of a young woman being forced to walk the perimeter of a roof until she’s finished drinking a bottle of vodka). During a break in their last year of college, seven gorgeous friends visit Mexico for one last urgent party before graduation separates them forever . Our hero, Olivia (Lucy Hale), is single and, at a party on their last night, falls for the charms of Carter (Landon Liboiron) who, after the bar closes, leads her and her friends to an abandoned hilltop church, or mission, or temple – a scary ruinous structure in the desert, which is framed from below to resemble the view that a Bates Motel tenant might have of the gothic mansion up the hill. Here, with everyone seated in a circle, Carter reveals that his intentions in luring them to a dilapidated church in the Mexican desert after midnight were, in fact, impure. He hopes to save himself, or at least buy a little more time on Earth, by reeling them into a haunted game of Truth or Dare. The player’s interlocutor assumes a hideous, demonic, ear-to-ear grin, their eyes turn red, and they make an offer: tell a dangerous truth or do something that’ll involve bodily harm. If you don’t tell the truth, or execute the dare, you die. It’s a silly premise for a silly movie that doesn’t take itself too seriously, plays at a svelte 100 minutes, and gives its demographic of 13- to 22-year olds the undemanding background stimulation they’re looking for. Certainly it’ll prove a success for Jason Blum, CEO of Blumhouse, which since its inception in 2000 has produced nearly 100 movies, some of them comedy (the early Dwayne “The Rock” Johnson vehicle The Tooth Fairy in 2010), some drama (2015’s Whiplash), but mostly – and most successfully – Blumhouse has become the master outfit for horror. Leading the genre with franchises like Insidious, Paranormal Activity and The Purge, Blum’s business thrives by rarely spending more than $7 or $8 million on a single production (maybe another couple in advertising) and then releasing it into the arms of eager young audiences. 2017 saw on of the studio’s biggest hits with Get Out, the critical darling that earned $250 million off of its $4.5 million budget. Writer-director Jordan Peele, who won an Academy Award for Best Original Screenplay, spoke to the New York Times about Blum, attributing his success as a producer to the habit of handing these modest budgets to promising filmmakers and them leaving them alone to do what they please. He’s done this with Rob Zombie (Lords of Salem), Eli Roth (The Green Inferno), M. Night Shyamalan (Split) and James Wan (Insidious). Not exactly a cast of critical favorites, but they’re distinct filmmakers who bring a loyal following to the theater. Better to invest a modest budget against the dependably business of a filmmaker’s pre-existing following than to risk eight or nine figures in pursuit of a blockbuster. 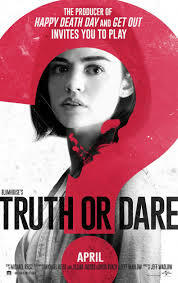 Just about the only interesting thing in Truth or Dare’s release is that it’s the first Blumhouse production to include the house’s name in the title: if you’ve searched for movie times at your local theater, you’re likely to find that its full title is Blumhouse’s Truth or Dare. Maybe this was an experiment, with Blum seeing if his brand could buoy a mid-level horror movie to some higher plane of success. He hasn’t affixed the house’s name to the title of July 4’s The First Purge, a prequel to – and the fourth installment in – that tentpole franchise. Is it worth the price of admission? Probably not unless you fall into the aforementioned demographic and you’re seeing it with friends. But maybe this title gimmick will serve as an interesting footnote in the biography of one of Hollywood’s most interesting living producers. Alex Sorondo is a writer living in Miami. His fiction has appeared in First Inkling Magazine and Jai-Alai Magazine. He is the founder of Thousand Movie Project.